Malathi Chandur మాలతీ చందూర్‌ - AN EXEMPLAR of a prolific writer and a portrayer of social transformation, it didn't take long for Malathi Chandur to attain the status of a novelist in popular demand. She has also become a lovable role model of sorts for the Telugus, especially women, with her plausible solutions to some of their day-to-day problems.Adding another feather to her cap, The Lok Nayak Foundation, founded by noted writer Yarlagadda Lakshmi Prasad (Associate Professor, AU Department of Hindi and former member of Rajya Sabha), recently presented a cash award of Rs. 1 lakh to Malathi and her husband Chandur Nageswara Rao. 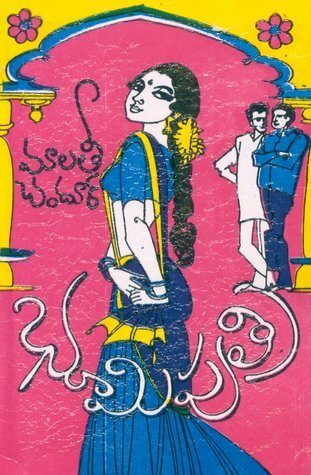 The award is given annually to an eminent Telugu writer or poet or a person credited with service for the cause of Telugu literature.Malathi first made a name for herself with her practical solutions, which she pens down in her `Pramadaavanam' column, that have been appearing non-stop for nearly five decades now in Andhra Prabha weekly. Starting with a short story `Ravvaladdulu' published in Anandavani weekly followed by `Luz Corner', she has also published stories like `Neeraja' in Bharathi, the prestigious monthly of yore. Her novels like `Champakam', `Cheedapurugulu', `Aalochinchu', `Sadyogam' among others won her many an award (about 16) including those conferred by the AP Sahitya Academy and Kendriya Sahitya Academy besides `Kalaaprapoorna' of the Padmavathi Mahila University.Her husband, Chandur Nageswara Rao, with his brilliant display of flair in creative writing and translation of notable works in English into Telugu and vice-versa, shot into the limelight as a potential writer with his short stories and mini-novels published in various magazines when he was hardly 20.Soon he preferred to settle down at Chennai (Madras) and started publishing a quarterly Kathaaveedi and Mali, a monthly, which was re-designated as Jagathi. Incidentally, he edited all the journals.He has also been a frequent broadcaster of talks on cultural and topics of social relevance from the Akashvani Studios of Madras. Today, he stands credited with about 30 volumes of original works and almost an equal number of translations.It comes as no surprise that Yarlagadda, along with other members like Gnanapeeth awardee C. Narayana Reddy on the selection committee, chose the Chandur couple for the award, which was given away for the first time.The award, along with a citation and shawl, was presented to them by renowned statesman Dr. Karan Sinh at a colourful function with Narayana Reddy as the chief guest.